Awake returns for the third instalment since the summer, and this time they’re stripping it back as they say thank you to all their loyal supporters. 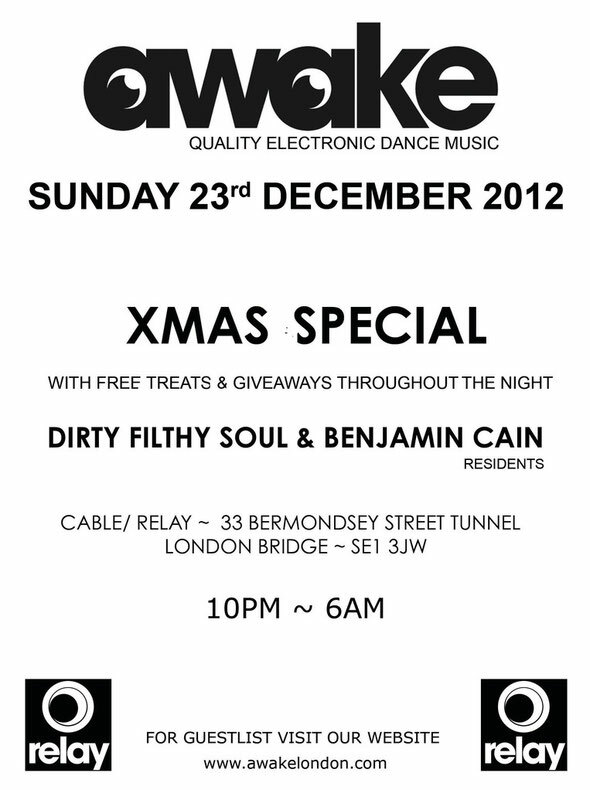 Taking over Cable’s most intimate room, Relay, on Sunday 23rd December, it’s a pre Christmas party toasting the people that have came to Awake each Sunday. Residents James Gaynor aka Dirty Filthy Soul and Ben Cain will be on from 10pm to 6am Monday morning and they’re taking everyone along with them for the ride. Good friends, party animals, industry bods, students with the knowledge; anyone who has the stamina, are all invited to join them for their final bash of the year. There are free treats and giveaways throughout the night and a special 12 days of Christmas mega comp, starting on the 12th December, offering Facebook fans the chance to win and receive a whole host of gifts from mixes, guestlist spots, free drinks and more, with one lucky winner in with the chance to win a year’s entry to Awake for them and a friend. Click HERE for more info.